As registration closed, Harris County’s voter roster had grown by more than 6 percent since 2014, the steepest increase in 16 years. More than 323,890 new names have been added, bringing the county voter roll to more than 2.2 million. Harris County is not alone. The Texas Secretary of State’s office two weeks ago reported the addition of more than 1 million registered voters across the state. “The growth is out of proportion of what we have traditionally encountered,” said Doug Ray, the assistant county attorney overseeing voter registration. Mi Familia Vota organizers say this election cycle, which has seen Hispanic people put at the center of some vicious debate, has inspired a boom in participation. In recent months in the Houston area, the group has set up voter registration booths at high schools, community colleges, festivals, fairs and church services. It even partnered with several taco trucks to distribute registration forms. The group’s local volunteers turned in 2,700 voter registration forms this year and handed out about 1,000 more. It stands to reason that if voter registration is way up statewide, then it will necessarily be up in the most populous counties as well. It may be a few days before we have final full numbers, but I’m guessing 15 million is well within reach. Of interest is that in Harris County, registrations among people with Spanish surnames were up 22 percent, while registrations among everyone else were up 10 percent. Make of that what you will. A record number of Bexar County residents could head to the polls this election, according to early totals from county officials. As of Tuesday afternoon, the last day to register to vote in Texas, 1,036,610 people had signed up to vote in Bexar County, about 118,000 more registered voters than in 2012, the last presidential election. With a few hours left to turn in voter forms, Jacquelyn Callanen, Bexar County elections administrator, expected that number could go up by at least 5,000 more. “We’ve been busy,” Callanen said over the phone from the election office on Frio Street. In addition to a steady stream of walk-ins, the office had as many as 50 phone calls at any given time. Travis County reached a voter registration milestone ahead of this year’s presidential election. Local election officials set a goal after the 2012 election to have 90 percent of the county registered. As of [Monday], officials met that goal. “Ninety percent of Travis County eligible citizens are registered to vote for the first time in recent history – maybe ever,” said Bruce Elfant, Travis County’s voter registrar. He says his office has stacks and stacks of voter registration cards. “You should see the pictures of the piles of cards over here,” he said. 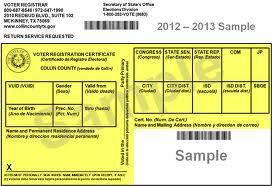 The Statesman puts that at 725,000 registered voters, possibly more, which is an increase of some 90,000+ over 2012. Harris County’s percentage of adults registered is just under 80%, according to the Chron story. It sounds like Travis County is measuring against the Citizen Voting Age Population, which if so is not truly comparable to Harris. Be that as it may, Travis County has always been an overachiever on this measure. Pre-deadline stories from Dallas County peg the increase at over 100,000 there, while El Paso County was at 420K total voters, or 35K more than 2012, as of Friday. Again, total registrations do not necessarily correlate to turnout, but no matter how you slice it, there’s going to be a lot of people voting this year. I can’t wait to see what the early voting numbers look like.